This custom shelter kit is 14 x 50 feet on the inside. 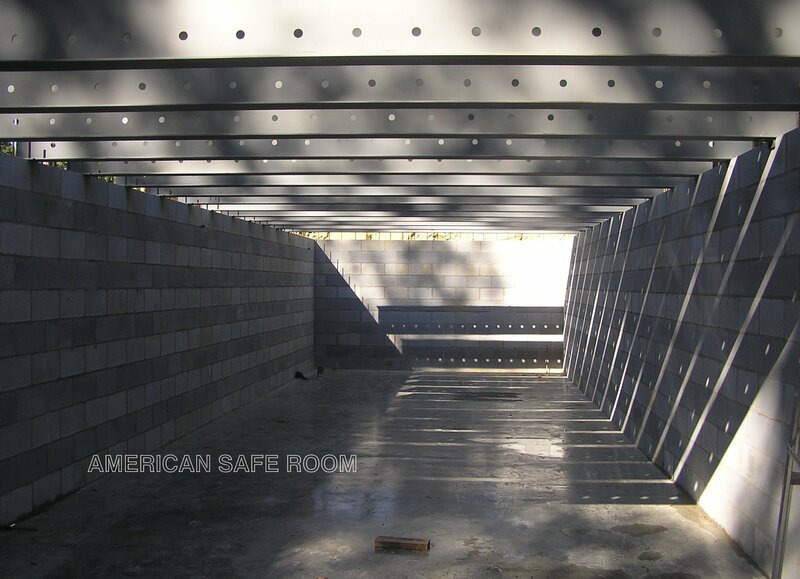 There are 19 ceiling trusses, a blast door in the front, a riser hatch in the back, a flat hatch on an escape tunnel, and another flat hatch on an adjacent generator room. The major components ready to ship. Note the trusses are stacked and banded on the riser truss pair. Not shown in this picture is the filtration system and all of the fasteners and brackets – which are high-def plasma cut so they fit together perfectly. 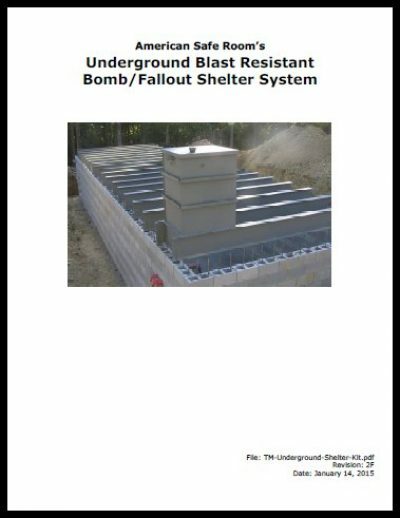 Many of the steps below reference sections of the shelter kit manual (PDF). 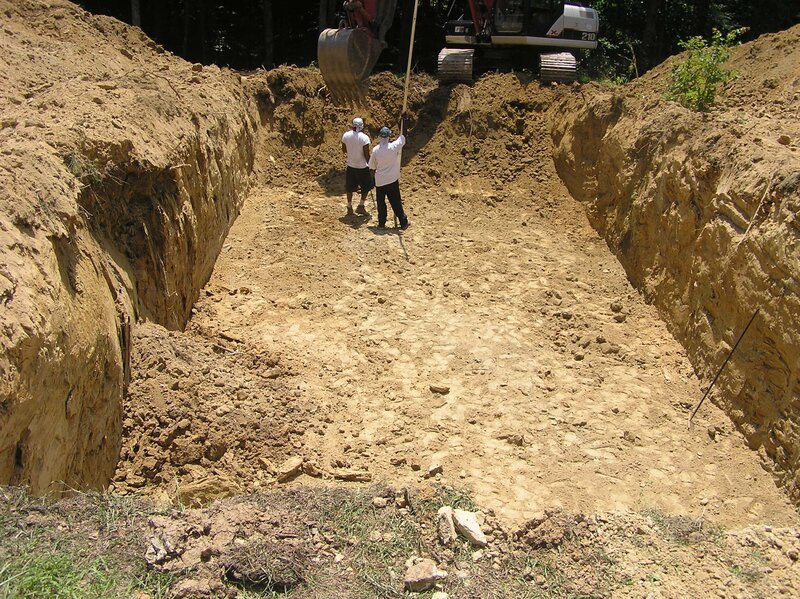 The excavation is started. Note the area on the left that eroded. 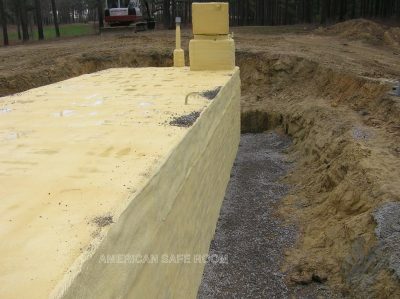 The slope of the walls will depend on what kind of soil you have. This shelter was sited on the top of a rise and the the backfill will be higher than the original grade. This allows for a shallower hole. The excavation is complete. 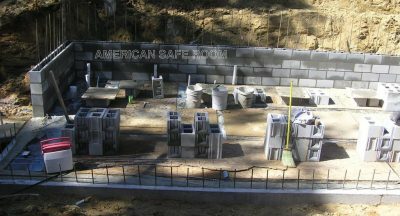 Note that the end of the shelter in the far end of the hole will be left exposed and will have a single leaf blast door. 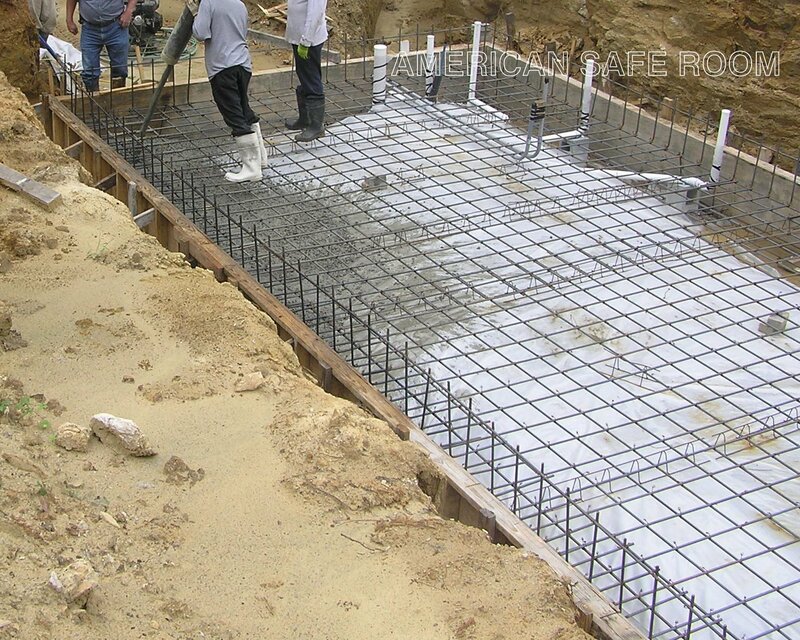 The plastic earth barrier and floor rebar are being installed. Rock has been put down under the plastic to help with water drainage. 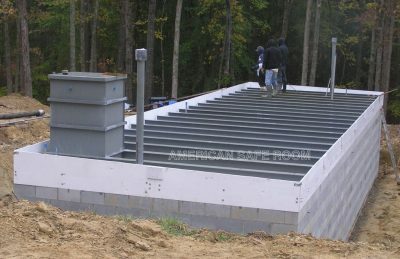 One nice thing about siting a shelter on a rise is that you can have gravity drains instead of sump pumps. 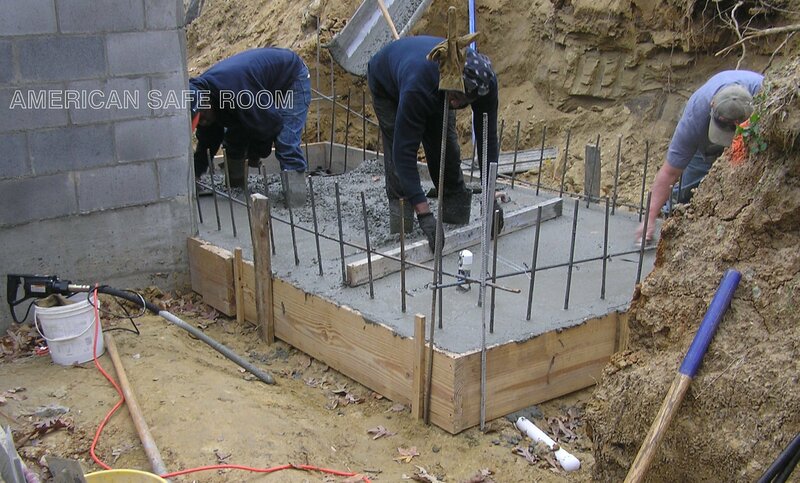 The floor forms and the rebar and plumbing are in place and they are pouring the floor slab with a concrete pump. Note the wall tie-in rebar sticking up around the perimeter. 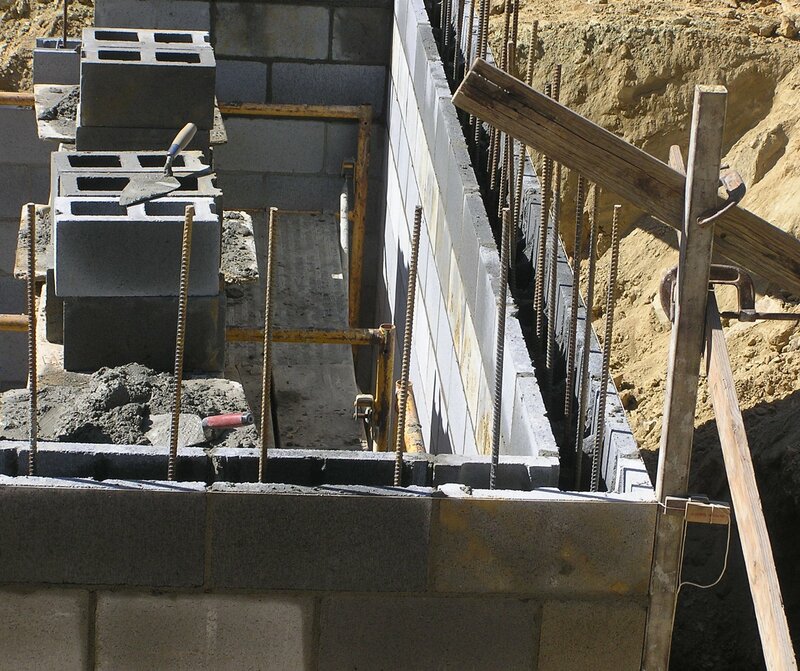 The blocks will be placed right over these pieces and then filled with concrete. 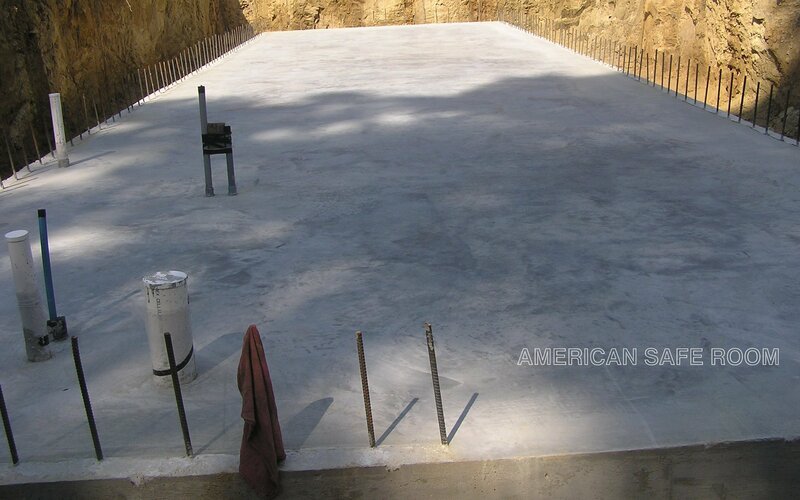 The floor pad is being leveled and screeded as its being poured. The wall tie-in rebar can be clearly seen. The floor slab has been screeded and finished. The floor slab after curing. 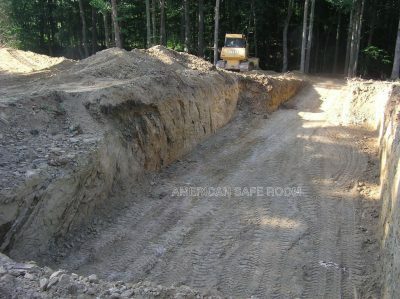 The forms have been removed and it’s ready for walls to be started. 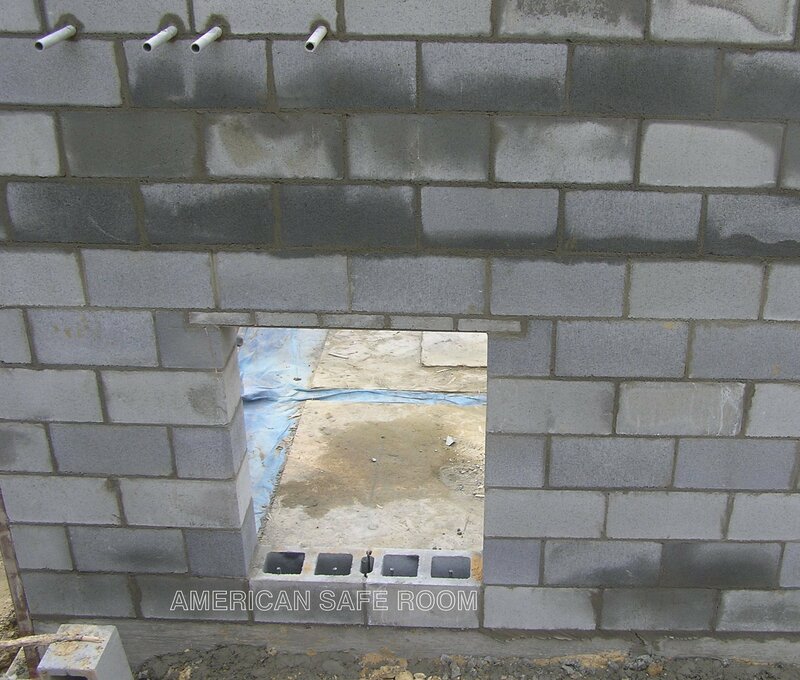 The gap in the wall tie-in rebar on the right side of the foreground is where the blast door will go. Starting the walls. 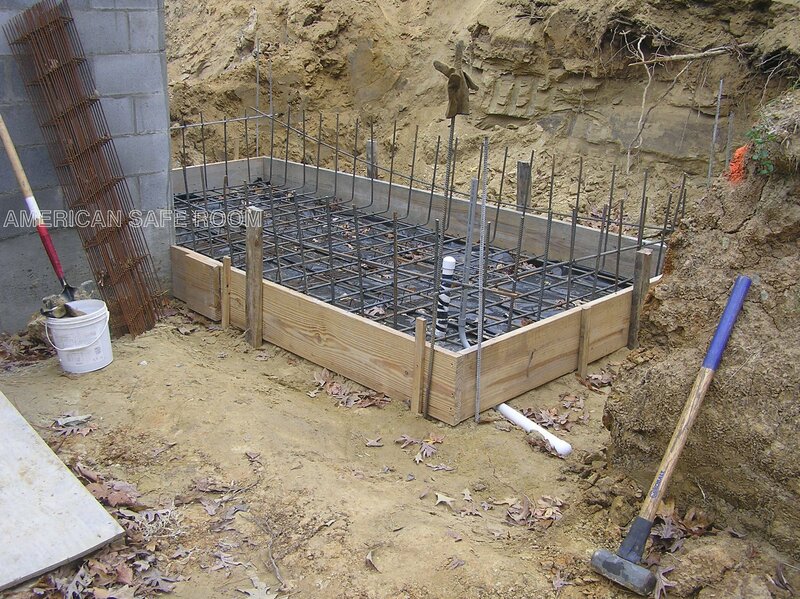 In the foreground is the floor/wall tie-in rebar and in the back, longer pieces of rebar have been tied to them. 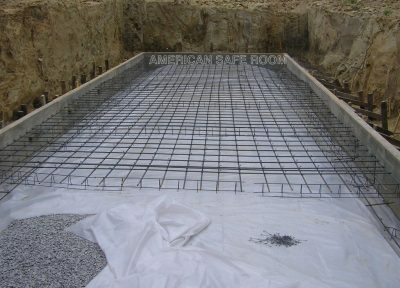 When it’s done, the floor, walls, and ceiling will all be tied together with rebar. 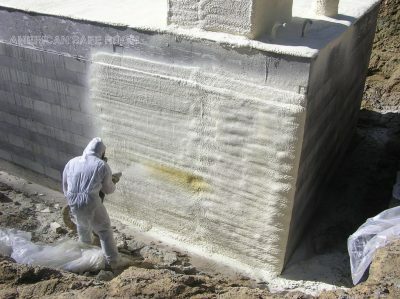 On the left, the rough opening for the blast door is started. 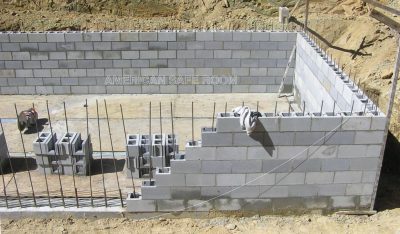 Seven courses of blocks are started. 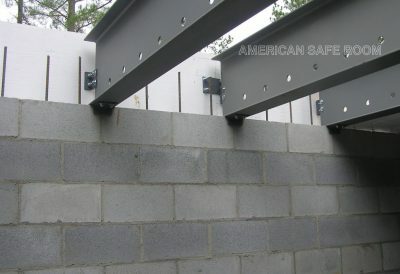 You can see the longer wall pieces of rebar tied to the floor tie-ins. Note the corner boards that ensure the corners are plumb and square. 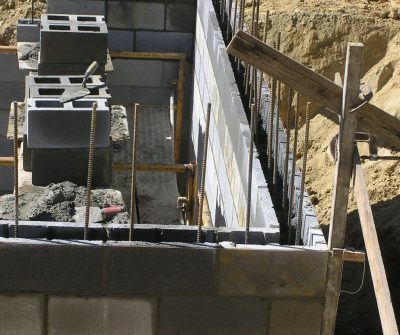 Also, see the blocks shaped like a “U” stacked up – they are bond blocks that allow for horizontal rebar to be installed. 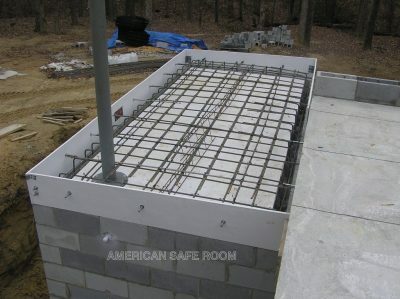 Every other course is made from bond blocks and has a run of horizontal rebar. This is a bond block course. 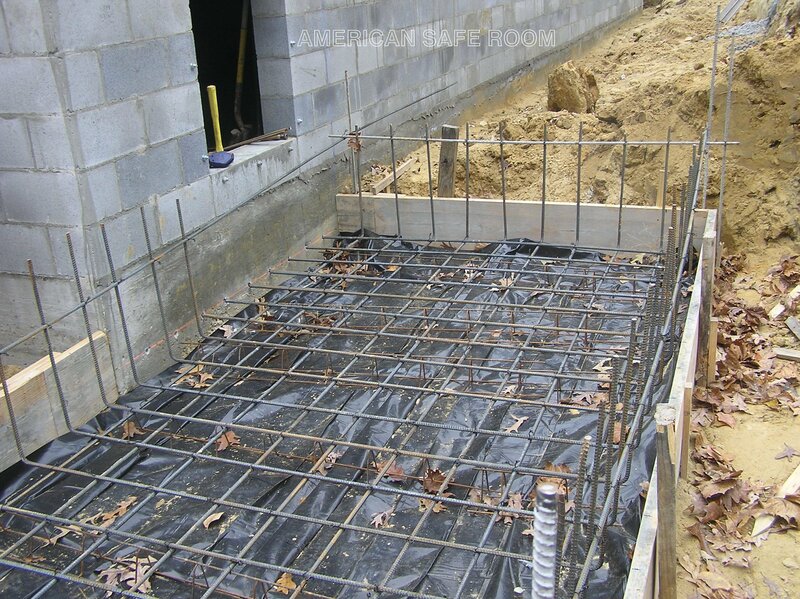 See the trough that a run of horizontal rebar will be laid in. Note the corner board that is staked in place in two directions to ensure the corners are plumb. This is a rough opening for a flat blast hatch that will allow access to an adjacent generator room. They’ve used a masonry saw to cut blocks in half to create the rough opening and a steel beam for a header. 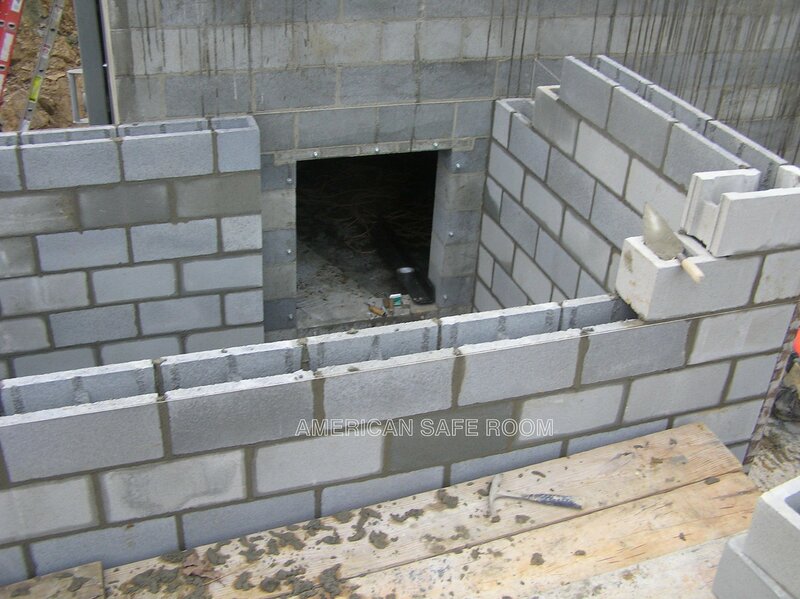 Here is the completed rough opening for the generator room hatch. The floor/wall tie-in rebar has been trimmed and the top has been finished with some small blocks. 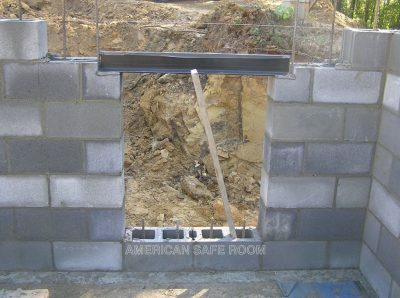 This is the completed rough opening for the 36 x 80 inch blast door. Note the cut blocks on each side. The left side has them every other course, the right side has them every course. 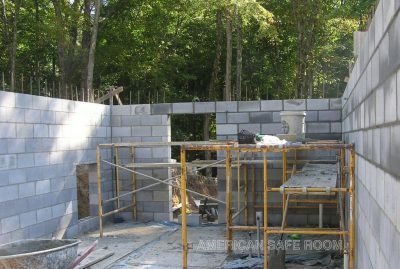 A masonry saw makes quick work of cutting down blocks. 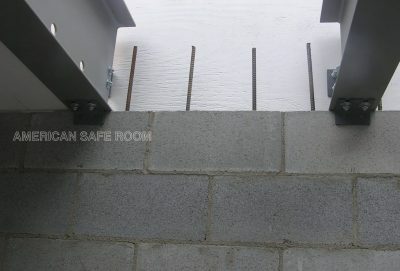 The 11 courses of the walls are complete and the wall/ceiling tie-in rebar is sticking up. The rebar in the ceiling will be tied to these pieces. The rough openings for the blast door and generator room blast hatch are shown. Note how much space there is with the 14 foot inside width. 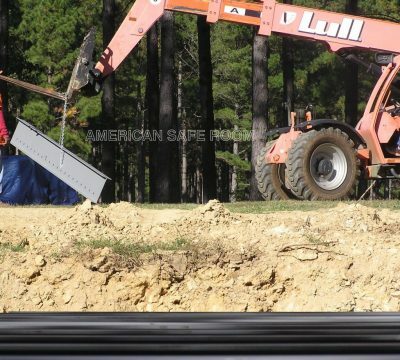 Prefabricated shelters must be under 10 feet wide – or they have to get expensive wide load permits for delivery. The ceiling trusses are being set. 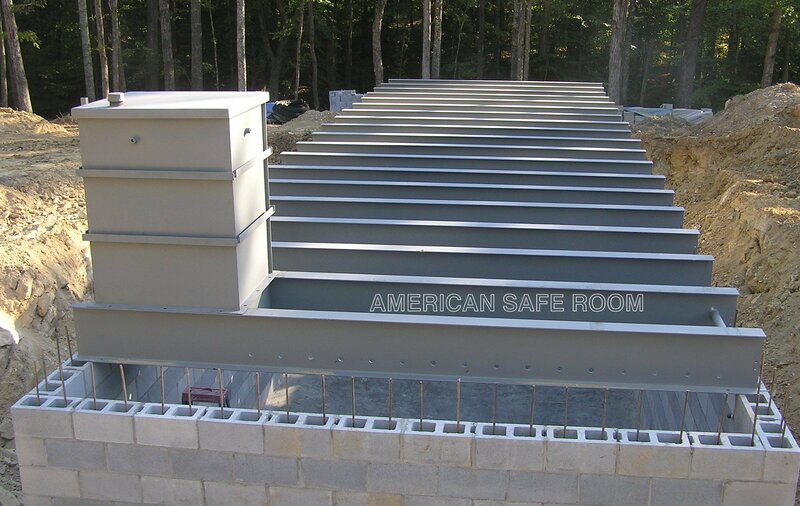 These wide flange beams will stay in place to reinforce the ceiling slab. 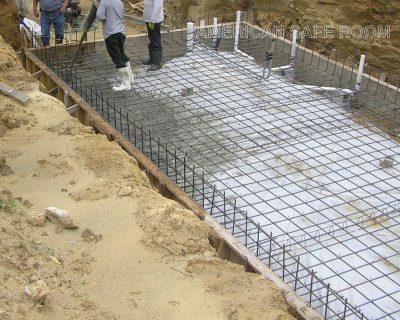 Beams are a much more efficient shape to carry loads than the round shape of rebar. Note the holes punched in the bottom of the beams for the longitudinal runs of rebar. Located at the bottom of the ceiling slab, this rebar will be in tension if the shelter has to adsorb a blast load. Picking the trusses to set them on the walls. All of the trusses are set in place. The trusses from the top with the riser blast hatch in place on the riser truss pair. We weld two trusses together with channel sections to form the ceiling penetration (hole) for the riser hatch. The hatch bolts right over the penetration and is poured in place – very secure! The trusses from the inside. The trusses are centered between the walls with angle brackets bolted to the bottom of the beams. The same brackets are bolted to the ends of the beams to hold the form boards for the ceiling in place. We provide all the brackets and their fasteners in this kit and the trusses have all the holes punched for these brackets. In this view of the truss centering brackets you can see that the brackets have holes in one end and slots that are plasma cut in the other end. The slots allow you to push the bracket tight to the wall so the beam can’t shift when you are pouring the ceiling. The trusses and the brackets are factory primed to inhibit rust. The top view of the trusses and ceiling form boards. 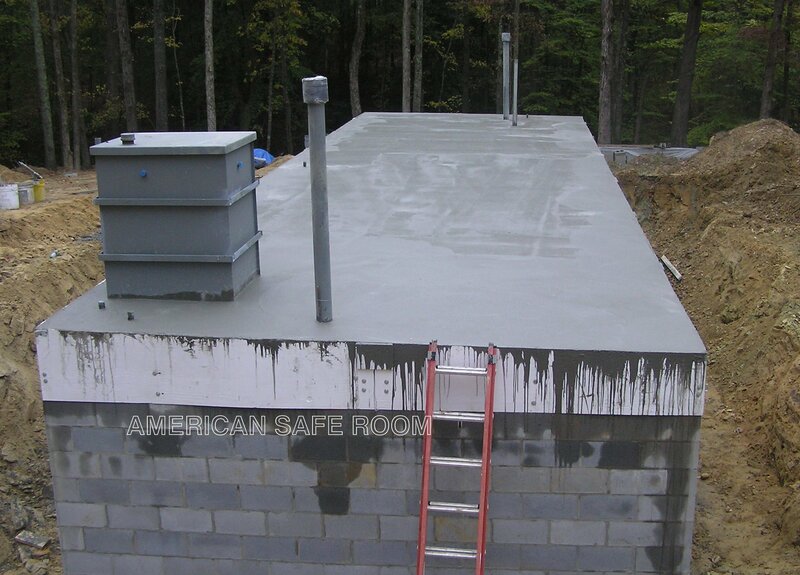 Note the intake ventilation pipe next to the riser blast hatch in the back of the shelter. The NBC filter will be at the back of the shelter and the outflow vent pipe will be at the front by the blast door so that the filtered air will have to transit the entire protected space before it is returned to the outside. This will ensure that oxygen is replenished and the carbon dioxide and water vapor that the occupants exhale is relieved throughout the shelter. The ceiling is ready to be poured. 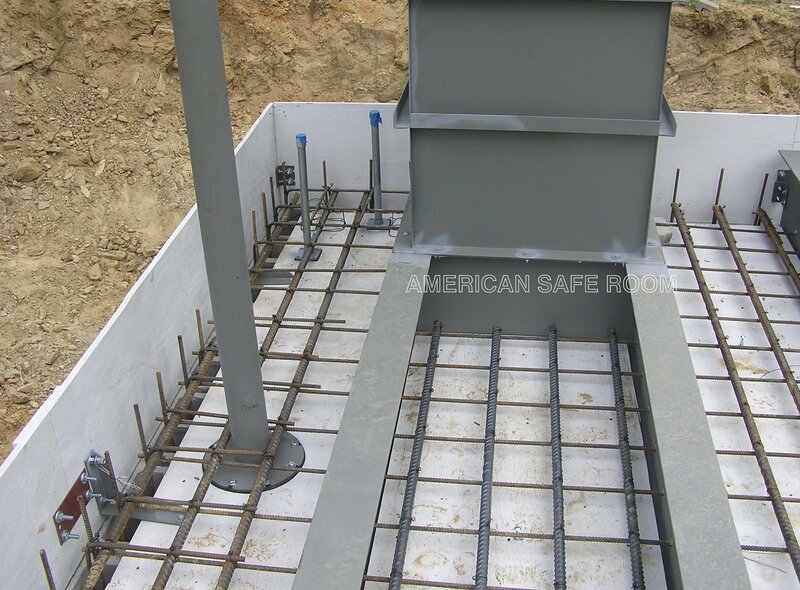 The riser hatch and both ventilation pipes are in place. 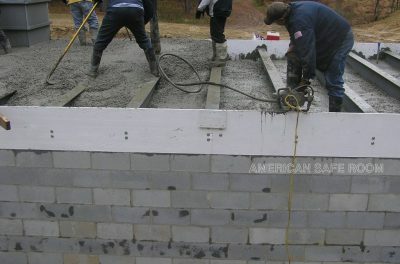 The pour is started at the back and will work toward the front. 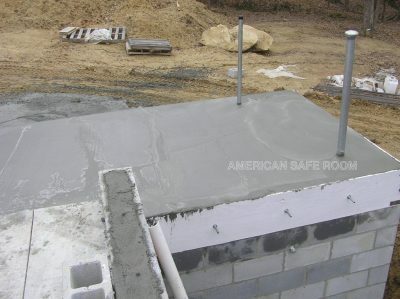 There is a slight slope built into the top of the form boards so water won’t pool on top of the shelter. 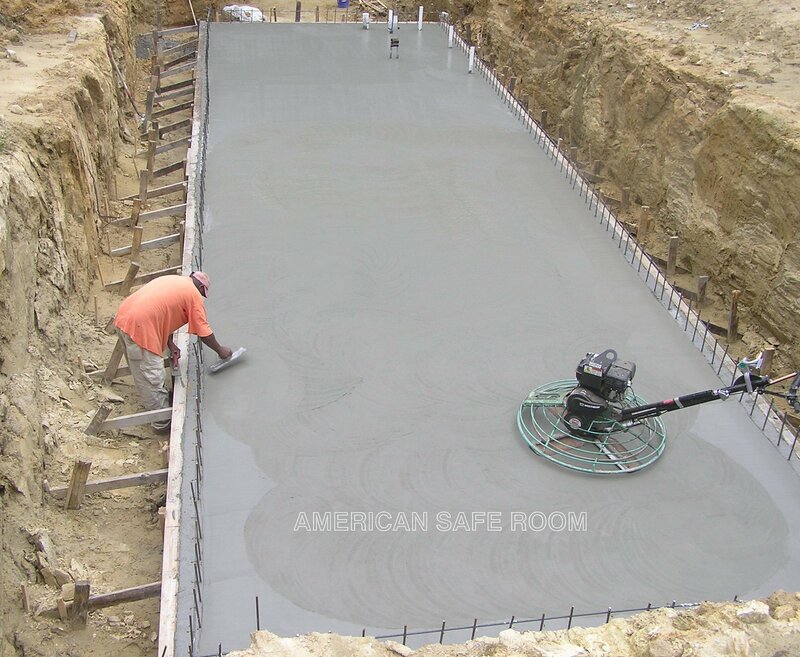 A vibrating tamper is used to clear voids in the concrete. 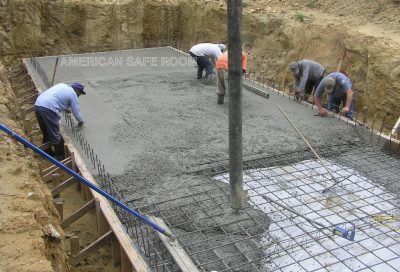 These are great when pouring slabs, but never use these when filling one of our concrete filled blast doors. It might bow out the door skins. The riser blast hatch and ventilation pipes are embedded in the concrete and will be further supported when this shelter is backfilled. The ceiling pour is complete and the surface has been screeded flush with the form boards. You can almost see the slope from one side to the other of the top of the ceiling in this picture. 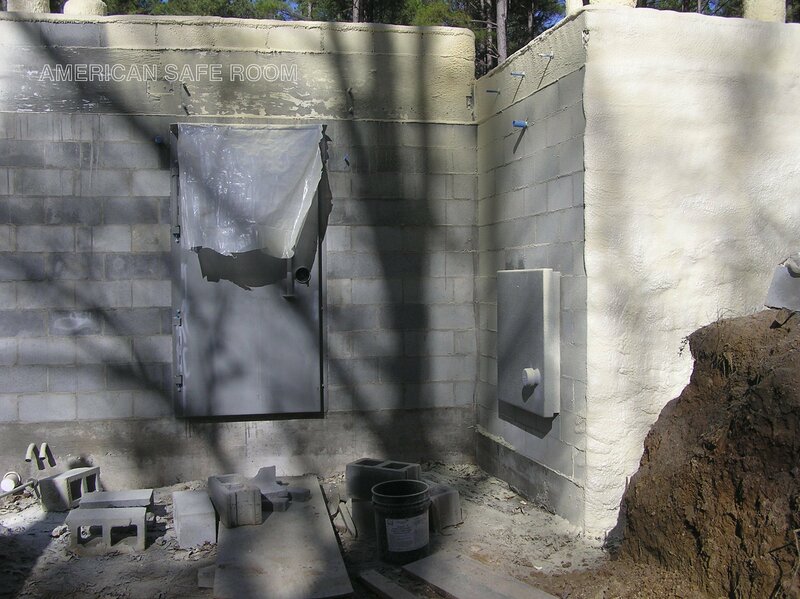 A perforated drain pipe will be laid in some river rock at the base of the shelter on the lower side. 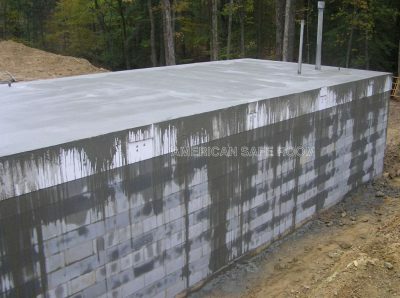 When everything is backfilled, any surface water that finds its way to the top of the shelter will run to the low side, down the wall, and into this drain. 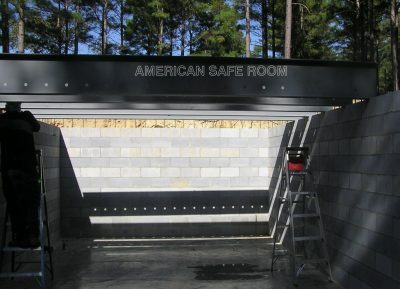 This is a generator room adjacent to the main shelter. Special care must be taken to ensure that carbon monoxide or fuel vapors do not migrate into the shelter or accumulate in the generator room. Generators should have their own air supply and have the exhaust pipe routed outside. 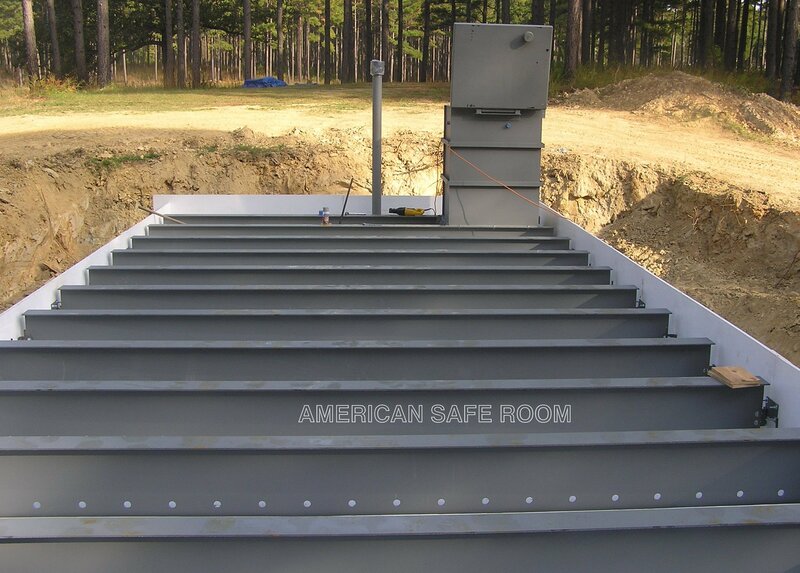 If the generator is going to use filtered air from the NBC filter in the shelter, the air consumption of the generator must be factored into the total air supply needed. 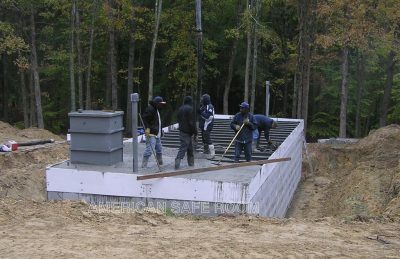 Generators with exhaust pipes routed outside are air pumps – they take air from the shelter and pump it outside. This can make the shelter go negative pressure, relative to the outside air pressure. This is exactly opposite of what is needed in an underground shelter which should always have positive relative pressure (overpressure). 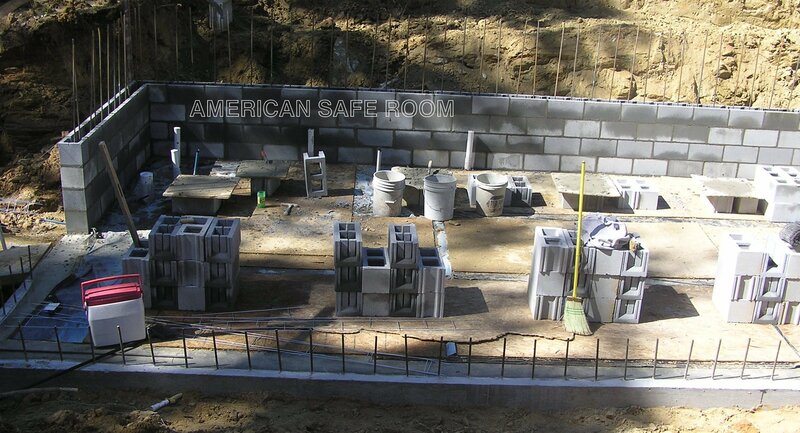 American Safe Room supplies parts in kit form. 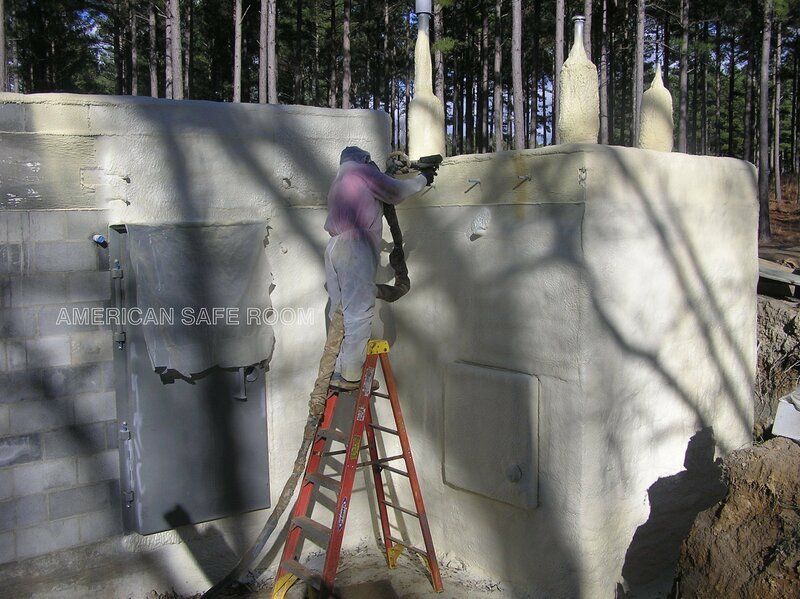 It is the responsibility of the installer and occupants to ensure that no carbon monoxide or fuel vapors enter the shelter or accumulate in a generator room. 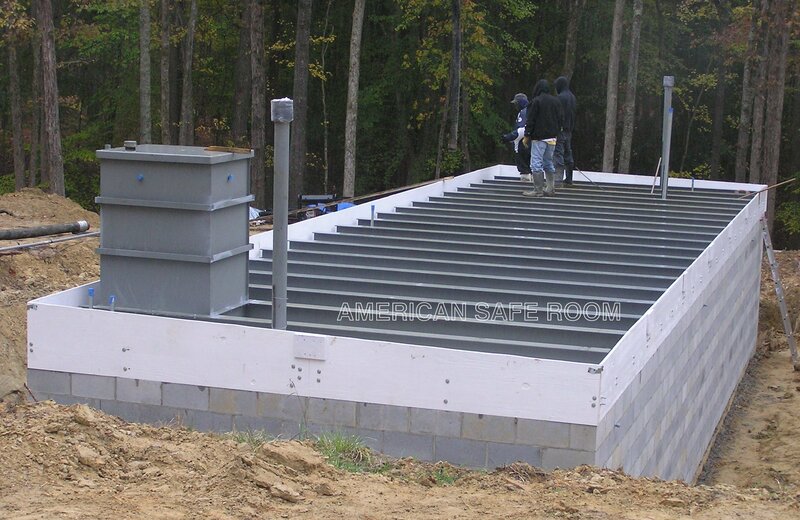 The small adjacent generator room will be built similar to the main shelter. The floor slab forms and rebar are started. The rebar is tied into the shelter floor slab by drilling into it and inserting the rebar into the holes. Just like the shelter floor slab, the floor/wall tie-ins are brought up along the edges. The floor slab being screeded on one end while the other end is being poured. 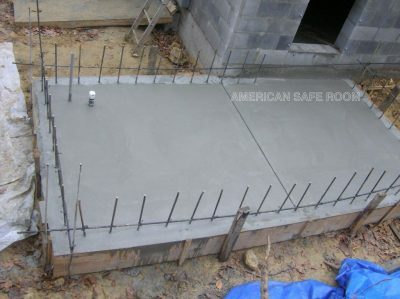 The floor slab pour is complete. The walls are started. 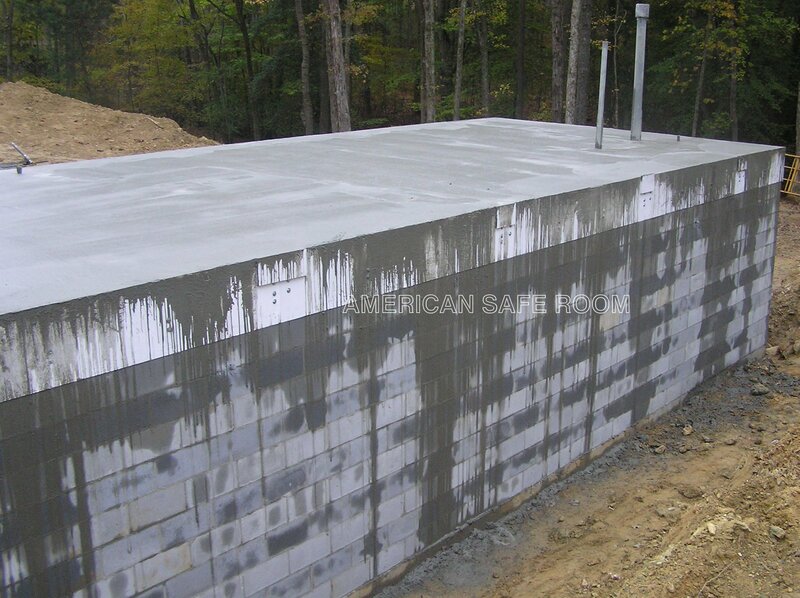 Note that the concrete wedge anchors for the hatch are in place around the rough opening. The walls are up, a bottom form board has been put down for the ceiling and the rebar has been placed. 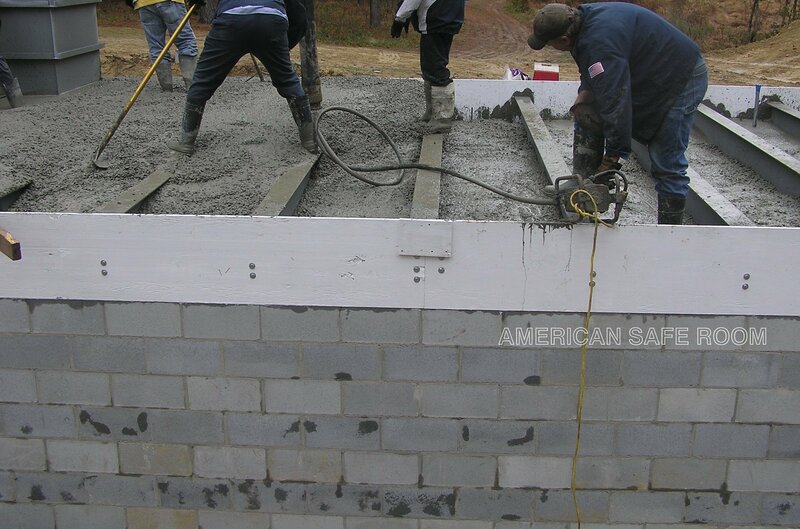 Temporary cribbing is inside to hold the concrete until it cures. Note the extra course of blocks on the shelter next to the generator room. 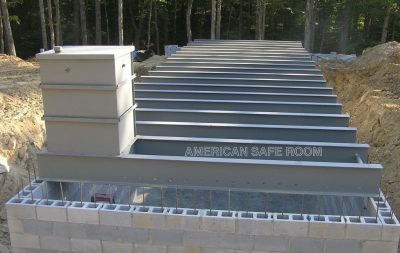 These will be filled with concrete when the generator room ceiling is poured to form a parapet over the exposed end of the shelter. The ceiling of the generator room after pouring. The outside access hatch of the generator room adjacent to the blast door on the exposed end of the shelter. Note that the generator room will serve as a wall to keep the backfill from covering the end of the shelter. The outside of this shelter kit was sealed with a spray foam product from Icynene. The sealant has been applied. 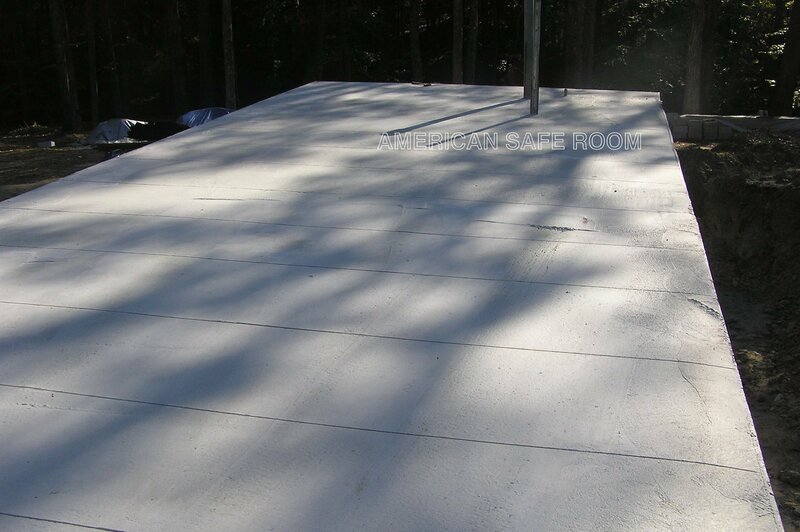 Note that the steel components have spray foam on them as well. 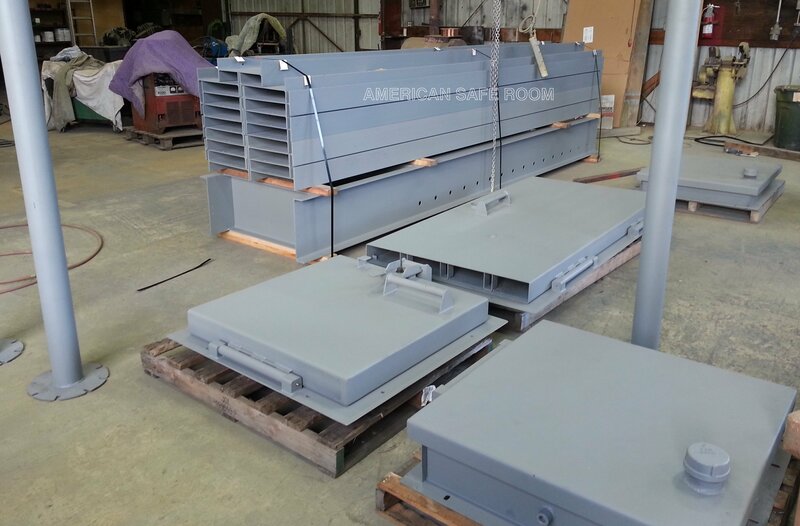 We apply a coat of primer as soon as they are fabricated. The spray foam sealant adds another layer of protection. 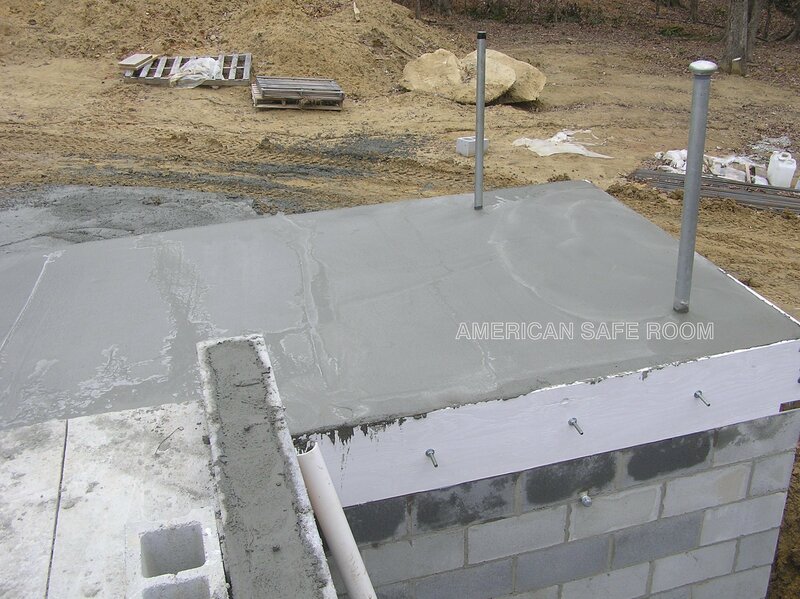 The optional single leaf blast door is mounted on the exposed end of this shelter. It allows easy access for people, pets, and equipment. 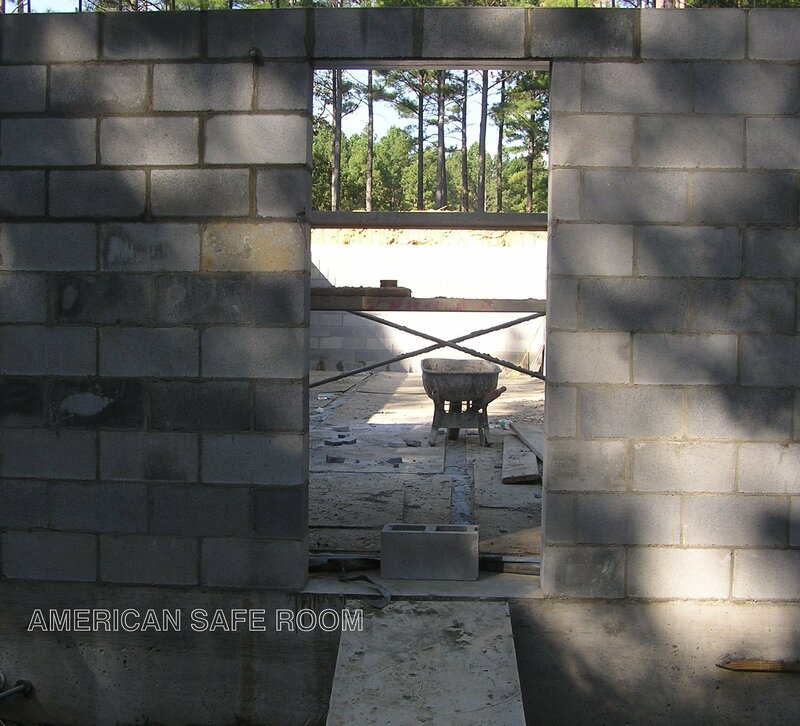 The door and frame are come all assembled and are bolted to the wall before the steel door leaf envelope is filled with concrete. Note the grease zerks on the ends of each of the hinges. They also feature oil impregnated bronze sleeve bearings so the 1,700 pound filled weight of the door takes only 20 pounds to open or close. 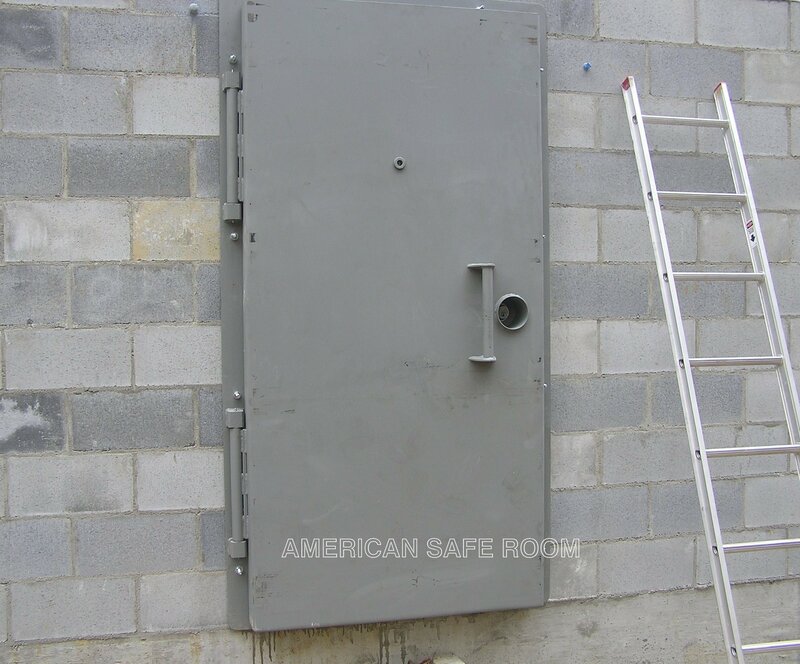 This blast door has the inset deadbolt assembly and wide angle viewer options. The riser blast hatch is bolted down on the riser truss pair. Right below the mounting flange at the bottom of this hatch, you can see the channel section we weld between the trusses. 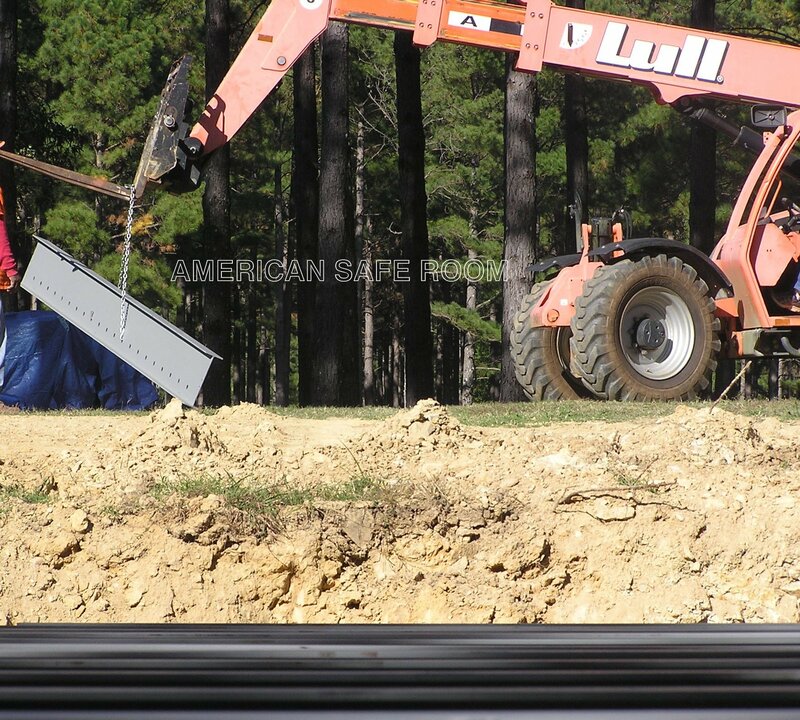 The rebar is cut so it butts up against this channel section. 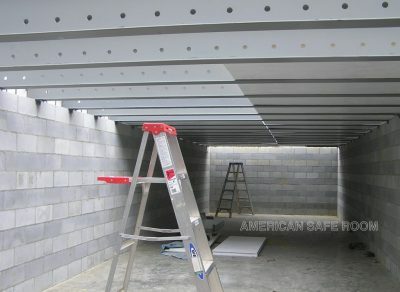 These channel sections and the trusses are forms that make the penetration hole for the hatch. 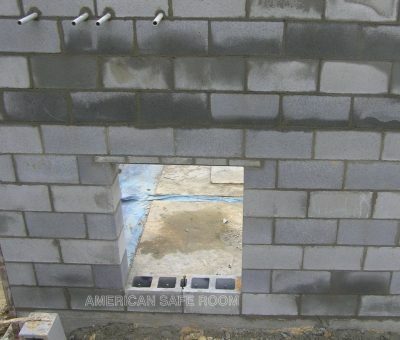 To the left of the hatch are two more one inch penetrations. To get a quotation on a shelter kit, please contact our sales department.